FLAGSTAFF — Bison are synonymous with the great west, but not many people realize that Arizona is home to these magnificent animals. 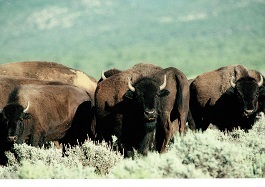 To increase awareness and provide information about this great animal, the Arizona Game and Fish Department will host a bison viewing workshop near Flagstaff on National Bison Day, Saturday, Nov. 3. The workshop will take place at the Arizona Game and Fish Commission-owned Raymond Wildlife Area (RWA) 30 miles east of Flagstaff. Sessions will begin at 9 a.m. and 10:30 a.m. and are limited to 20 people each. Both include a presentation, field trip and a light lunch. Each session costs $35 and the deadline to register is Nov. 1. Participants will receive the same information, presentation, field trip, with lunch including bison burgers or brats and sides. The viewing workshop is recommended for those 12 years or older. All fees support the Department’s Watchable Wildlife Program, which was created to increase public awareness of wildlife through positive and personal wildlife viewing experiences. Raymond Wildlife Area is approximately 30 miles east of Flagstaff on I-40. To reach Raymond Wildlife Area, take I-40 east from Flagstaff and take exit 225. Turn right after exiting the freeway. Go 10 miles south on Buffalo Range Road to the visitor’s center. Visitors should be aware the last 10 miles is along a relatively unmaintained dirt road but accessible for passenger vehicles. Raymond Wildlife Area was purchased by the department in 1942 from Flagstaff physician R.O. Raymond to serve as winter range for the Anderson Mesa pronghorn antelope herd. Due to drought conditions in 1945, the area became home for bison that were moved from the House Rock Valley herd. Some scopes will be available, but it is recommended that participants bring binoculars, water, snacks, and dress appropriately for the weather and field trip. More details on the field trip will be provided during the presentations.